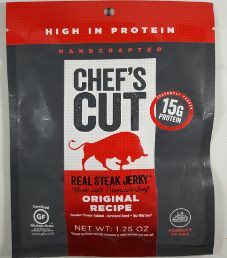 This next review for Chef’s Cut Real Jerky will focus on a 1.25 ounce/35 gram bag of their Original Recipe flavored beef jerky. This flavor is described as a unique blend, combined with their proprietary smoking process, giving the perfect proportion of salty, spicy, and sweet. The bag was purchased for $3.49 at a ShopRite store in Lyndhurst, New Jersey. 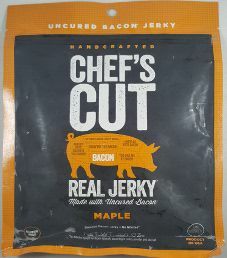 This next review for Chef’s Cut Real Jerky will be on a 2 ounce/56 gram bag of their Maple flavored bacon jerky. The bag was purchased for $6.49 at a Fairway store in Woodland Park, New Jersey. 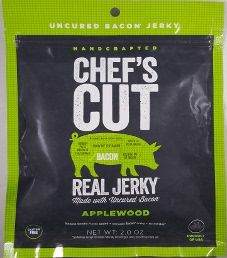 This next review for Chef’s Cut Real Jerky will be on a 2 ounce/56 gram bag of their applewood flavored bacon jerky. The bag was purchased for $5.49 at a ShopRite store in Lyndhurst, New Jersey. This flavor is described as combining brown sugar, honey, and Applewood smoke flavors that will have you reaching for more. 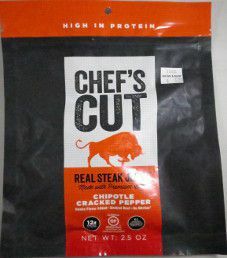 This review will focus on a 2.5 ounce/71 gram bag of Chef’s Cut Real Jerky chipotle cracked pepper flavored beef jerky. The bag was purchased for $6.99 at a Bed Bath & Beyond store in Woodland Park, New Jersey back in 2015. 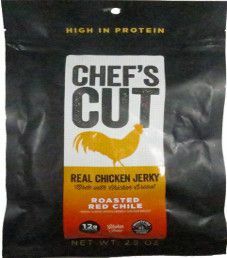 This review will focus on a 2.5 ounce/71 gram bag of Chef’s Cut Real Jerky roasted red chile flavored chicken jerky. The bag was purchased in December 2014, for $6.99 at a Fairway Market store in Woodland Park, New Jersey.